"How are we going to have fun if we're studying and doing good deeds and mitzvot (commandments) all day?" "But what are we going to do in the Messianic Era?" The dedication and devotion of sports enthusiasts - participants or fans - is unfathomable to one who has no interest in sports. Rap doesn't fit into the category of music to many people, yet it has many devotees worldwide. This week's Torah portion, Noach, recounts in detail the story of Noah, G-d's command to him to build and ark, and the ensuing Flood that destroyed much of the world. The Torah, however, is not just a book of "Bible" stories, nor is it a mere historical account of a certain period of time. Rather, it contains daily lessons for us in how to conduct our lives. In a book of Jewish mysticism titled Torah Or, it is explained that the Flood was not simply the punishment for a totally corrupt world. For, to destroy the world, G-d could have chosen any number of different methods to this end. The Flood was also an act of purification, which is why the deluge lasted for forty days. The number forty corresponds to the forty seah (a liquid measurement) in a mikva (ritual bath). Further on in the same text, it is explained that worries and troubles concerning one's livelihood are called symbolically "many waters." And, in fact, they have the same effect as the waters of the Flood; they rinse the undesirable elements off a person. The relationship between worries about livelihood, the Flood, and mikva, can be seen as follows. The esoteric purpose of using a mikva is the concept of self negation. That is why a mikva requires forty seahs, an amount sufficient to cover the whole body. Also, the Hebrew letters of the word "tevila" (immersion) are identical to those of the word "habitul" (the nullification). This means that the act of self negation, of stepping out of one's ego, elevates man so that he may become a 'receptacle' for holiness. This is the intended purpose for anxieties about livelihood befalling a person. Though they temporarily disturb and confuse, they cause a person to be crushed within himself thus stepping out of his ego thereby rendering him a vessel for holiness. The ultimate intent, then, is not to punish the person, but to rinse and cleanse him of all impure matters. Obviously, this can be achieved very quickly, even instantaneously, as one perceives this inner meaning and intent thereby effecting within himself that which the events seek to accomplish. Most 20 year-olds from Brooklyn would agree that a road trip through California would rank near the top of the list of great things to do during the summer. But for Ari Shapiro and Chaim Bronstein, the road trip experience focused on something other than fun and sun. These two young Chabad rabbis have spent the hot summer weeks touring California's prisons. Their travels have brought them to the furthest reaches of the state as they sought out the wayward souls incarcerated in the penal system. Rabbis Shapiro and Bronstein are part of Chabad's prison chaplaincy program, which tends to the spiritual needs of Jewish inmates within the 33 state prisons and 6 federal prisons operating in California. "It's specifically here, in this harsh environment, where the human soul is so desperate for connection." Most of Chabad's efforts to serve the West Coast Jewish communities are well known, but this mission has been steadily progressing over time with much less fanfare. For the past 25 years, Chabad has been caring for the spiritual needs of Jewish people behind bars. The Jewish incarcerated are one of the most vulnerable and downtrodden sectors of the Jewish community - and are often overlooked and forgotten. "Most people are incredulous when I speak about my experiences with Jewish prisoners," says the director of Chabad's prison chaplaincy efforts, Rabbi Yosef Loschak of S. Barbara. "It's as if there's some kind of mental block which refuses to recognize that we have a segment of our population behind bars." Indeed, according to Rabbi Loschak, the number of Jewish prisoners overall is in line with the overall Jewish national population. He estimates that while Jews are demographically under-represented in maximum-security prisons, they are over-represented in minimum-security facilities. "The needs of the Jewish prisoner are so much greater than someone on the outside," he explained. "Incarceration compounds an individual's stress and anxiety in a measure that most people cannot understand." There is also a high level of undisguised anti-Semitism in the prison population. This combination of factors makes many prisoners yearn to reconnect with their religious roots. "Particularly amongst the white-collar criminals, you see a very profound spiritual change," said Rabbi Loschak. "Here you have someone who had a good career, a home, a family... And through one stupid move, he loses everything - not the least of which is his freedom." Even from his first visit, Rabbi Ari Shapiro noted the enthusiasm and profound gratitude of the inmates he visited. "The connection made with the inmates is so much deeper and meaningful than working on the outside," he said. "Many of them are so desperate to find some meaning and perspective in their lives. You can tell they appreciate every moment they have with you. It's like you're bringing them life." "Most inmates are very, very respectful," said Rabbi Chaim Bronstein. "Even the ones who dislike you still respect why you're there and what you're doing. You're giving your time and energy to care for someone on the inside. They respect that a lot." Rabbis Bronstein and Shapiro visited up to three prisons a day during the summer. Since most communities want to avoid having correctional facilities nearby, the locations of many prisons are quite remote, often hours away from the nearest town. In one case, the two drove fifteen hours from Southern California to the infamous Pelican Bay facility to visit its lone Jewish inmate. After arriving, they discovered that paperwork vital for their admittance was mishandled - leaving them with no way to gain entry. In time, the guards called the warden directly to explain that two rabbis from Brooklyn had shown up for visitation without proper paperwork. The warden himself came to the prison gate to greet them. "He was so moved that someone would come all the way from New York to visit an inmate, that he personally escorted us through the facility," the rabbis said. "During our trip to Pelican Bay, a riot broke out in the South Wing, causing the prison to get locked down - meaning that no one comes in, and no one gets out. Fortunately, this happened we were in the North Wing, and we were allowed to leave on schedule." Nonetheless, Shapiro states that he's never felt in danger during his visits. At one point, he was face to face with a Jew in solitary confinement. The Rabbi asked if he was allowed to put his hands through the bars. "At your own risk," answered the guard. He used the opportunity to put tefilin on the young man. "It is a very harsh environment," said Bronstein, "But it's specifically here in this environment where the human soul is so desperate for connection. Many of the inmates are so grateful for our few minutes together. It's amazing to see what kind of emotion it brings out of a person." "And if someone wonders, what are we doing here? I say, this is Chabad. We're here to help." Rabbi Loschak put it this way: "Everybody has made mistakes - and some of these prisoners have made terrible mistakes - but our mission is not to judge them for their past. These inmates are still human beings, regardless of what brought them to prison; we have an obligation to reach out to them." Modern medical wisdom recognizes that good health depends on a patient's emotional state and mental attitude. For centuries, it has been customary for Jewish women to adorn both the birthing room and the cradle with Psalm 121 (Shir Lama'alot). The Psalm states our declaration of dependence upon the Creator for our safety and well-being, and His commitment to guard us at all times. To get a color print of the Psalm call LEFJME at (718) 756-5700 or e-mail, intocenter@aol.com, or visit www.LchaimWeekly.org/general/art/shir-lamaalot.jpg. ...I am confident that you will utilize your distinguished position, which brings you into personal contact with Jewish youth, to strengthen their Jewish identity. To be sure, the courses which you teach are undoubtedly far removed from the religious and spiritual aspects of Jewish identity. However, it is surely unnecessary to emphasize to you that students generally look up to their professors, not only as experts in their particular fields, but also as persons and individuals who have accomplished a great deal in their lives and have attained high status. Consequently the views and ideas that a professor expresses, and especially his personal way of life and world outlook, directly and indirectly influence his students and create in them a desire to emulate their professors. And even those who for one reason or another are rebellious, inwardly recognize that the achievements of their professors should be emulated. In the light of this, a professor in college or university has an extraordinary opportunity to benefit his students by word, and even more so, by example. Even if an extra effort in this direction may entail certain difficulties which are sometimes not imaginary nor magnified, but real - the thought of how much good a little extra effort might do, and how much it can be reflected and multiplied in the lives of the young people who so need guidance and inspiration, should make all such difficulties worthwhile. Although the above has been written in general terms, with a view to disseminating Jewish values, etc., it is important to bear in mind the dictum of our Sages that the "essential thing is the deed," namely, the actual Jewish experience in daily life. For, Judaism is a way of life that is not relegated to several days in the year, specific holy days, or even Shabbos, but embraces all of Jewish life each and every day. It is for this reason that the Torah and mitzvoth [commandments] are referred to as "our life," indicating that their fulfillment must be continuous and uninterrupted, just as life must be continuous and uninterrupted. Herein the Jewish religion differs radically from any other religion, in that it is not something additional to the person, but is intimately the person himself, for a Jew and Torah and mitzvoth are inseparable. ...Both the Baal Shem Tov and Rabbi Shneur Zalman, who brought the Chasidic experience to Jews of all backgrounds, made the embodiment of the three loves - love of G-d, love of the Torah and love of the Jewish people - the cornerstone of their system, with emphasis on the fact that the said three loves are completely interlocked and integrated. 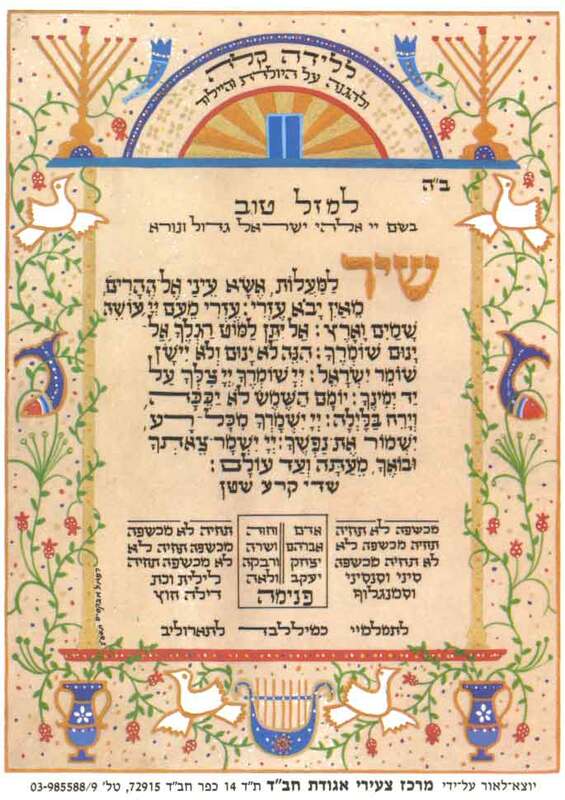 This system and way of life, which illuminated Judaism, quickly began to spread and gain many followers, in an ever-growing measure in quantity and quality, from generation to generation to the present day, which has clearly demonstrated how viable and vital it has been for the individual Jew as well as for the Jewish people. I have used the expression "illuminate" advisedly, since this does not necessarily mean the creation of new things, but the illumination of existing things which have not been fully appreciated, or which have been altogether overlooked. Thus, the primary contribution of Chassidus is that it illuminates Torah and mitzvoth, and their inner aspects and shows each and every one of us the way to bring them within one's personal daily experience. The above is particularly important in relation to the younger generation, which is still at the threshold of independent life and has untapped resources of energy and dedication to face any challenge, to accept the truth and nothing but the whole truth, rejecting all compromises - in its search for the genuine article. As for the teacher and mentor, while he must do his best to help those whom he teaches and guides to make the utmost progress, he also reckons with the capacity of the students. However, since it is the task of each and every Jew to follow the Torah way of life, with dedication and inspiration, as illuminated by the teachings of Chassidus - it is clear that this task, which has been given every Jew as a duty and privilege by G-d is within the capacity of each and everyone, since G-d does not expect the impossible. A special "Prayer for Travelers" (Tefilat HaDerech) is said upon reaching the outskirts of the city from which you are traveling. If one will be away for more than one day, the prayer is said - without using G-d's name - each subsequent day after the morning prayers. "A tzadik in Peltz" i.e., a righteous person in a warm, fur coat. This is one way of describing Noah, whose story we read about in this week's Torah portion. There are various ways to warm oneself when in a cold room. One way is to build a fire (or turn up the heat). A second method is to bundle oneself up warmly. If one builds a fire, the entire room becomes warm and all of the people in the room benefit. If, however, he just wraps himself up all cozy and snug, he is the only one who profits. The Zohar explains that one of Noah's greatest faults was that, though his own behavior was righteous, he did not try to influence others. In Noah's generation, everyone except his own family, was totally immoral. G d informed Noah that He would destroy the entire world with a flood, saving only Noah's family. Yet, Noah did not argue with G d. Instead, he withdrew into his own little world, building the ark and continuing in his own personal righteous ways. Only when people approached and asked what he was doing, did he tell them about the impending disaster. For these reasons, the flood is referred to in the Bible as the "Waters of Noah." Noah could have averted the disaster if he had reached out to his fellow man. But he clothed himself warmly in his righteous deeds, unconcerned with the bitter "cold" from which his generation suffered. When we see another Jew in the cold, we must not just bundle ourselves up even more warmly. Rather, we must invite him in and build a fire helping fan the spark within every Jew into a burning flame. Noah refers to the tzadik - the righteous person - in every generation. Because of the tzadik, G-d also remembers "every living thing and all the cattle." The Baal Shem Tov gathered together a small group of his disciples and bid them to quickly get ready for a trip. The Baal Shem Tov's Chasidim were quite used to short notice orders. They often traveled by coach with their Rebbe, usually leaving in the late evening and, at the break of dawn, miraculously finding themselves hundreds of miles away. But, wherever the place, whatever the time, they knew that eventually they would find out the reason for the mysterious trip. The Baal Shem Tov and his students sat themselves in the coach and Alexi, the driver, sat outside. Within a few minutes, Alexi had fallen asleep and the coach picked up speed. Though without a driver, the horses knew exactly where to go as they sped across the land. In the morning, the Baal Shem Tov and his students found themselves in a small Jewish village. The town was just beginning to wake up and the visitors quickly made their way to one of the little shuls. The Baal Shem Tov walked in quietly and motioned his chasidim to do the same. Inside, the noise was nearly deafening. Of the thirty men gathered in the shul to say the morning prayers, most seemed to be conducting some type of business transaction. Even during the Torah reading, many of the men were talking and whispering to each other. Those who were praying were simultaneously gesturing to their friends or staring off into space in boredom. The Baal Shem Tov left the synagogue, motioning for his chasidim to follow him. Once outside, he told them quietly and with the utmost seriousness, "The shul that we were just in is full of Jewish prayer." Surprised and shocked, the chasidim waited for some type of explanation, but none followed. "What might the Baal Shem Tov have seen in other 'worlds' that they could not perceive to allow him to make such a statement?" they wondered. Quickly the Baal Shem Tov lead his followers to another small shul, not far from the first. Inside, they found another group of thirty-or-so men offering their morning prayers. But this shul was indeed different from the first. Here, too, silence did not reign. But the sounds that one heard could not be categorized as noise. There was the sound of a sigh from one bemoaning the long exile, or the heart-breaking sob of one unburdening his troubled heart to his Maker. There, too, was the sound of joyous melody as the worshippers praised their Creator with ancient prayers. The Baal Shem Tov once again led his disciples out of the shul. "This synagogue is empty of prayer," the Baal Shem Tov announced to his amazed chasidim. The chasidim now waited patiently, certain that soon the Baal Shem Tov would reveal the meaning of his extraordinary statements. And so, he did. "Whenever a Jew prays or performs a mitzva, an angel of sorts is created by the prayer or mitzva," the Baal Shem Tov explained. "When the prayers are said wholeheartedly, when the mitzvot are performed with sincere intention, the newly formed angels are whole and perfectly shaped. They can easily fly straight to the Heavens where they will act as advocates for the person and his family. Too, they will be there when it is time to welcome the one who brought about their formation and defend him against strict Judgment. "But when prayers are said without concentration, and mitzvot are performed haphazardly or for the wrong reasons," continued the Baal Shem Tov, "the angels they create are 'crippled.' They cannot break through the gates of heaven. They cannot even fly to the heavens. They cannot argue the case for the person or his family now or in the Final Court. They remain here on earth." The faces of the Baal Shem Tov's chasidim began to light up in understanding. "And so," concluded their rebbe, "The first shul we went into was filled with, nebuch (a pity! ), crippled angels of Jewish prayer. The worshippers there were not praying with any feeling or concentration and their prayers were stuck in the synagogue. But the second shul we visited was different. There, the prayers, offered sincerely and wholeheartedly, were able to soar to the Heavens, through the gates, where they appealed to the Supreme Judge to heal and have mercy, to bless and protect. And there, the beautiful and sparkling angels will remain until such time as they need to welcome the person who formed them." Rabbi Shimon Bar Yochai said: How beloved is the nation of Israel unto G-d, for the Divine Presence accompanies the Jewish people no matter where their exile leads them. G-d Himself will return together with His people when He leads them out of the exile with the coming of Moshiach.